Hard to believe but RPC recently celebrated it’s 15th birthday! The original 3D Studio RPC plug-in and a whopping 32 pieces of RPC content were introduced to the world at the AEC Systems tradeshow [Booth 631] in Chicago in June of 1998. The “ArchSoft RealPeople Plug-in” with Casual People Vol 1 was $399. Business People Vol 1 was another $199. How things have changed! 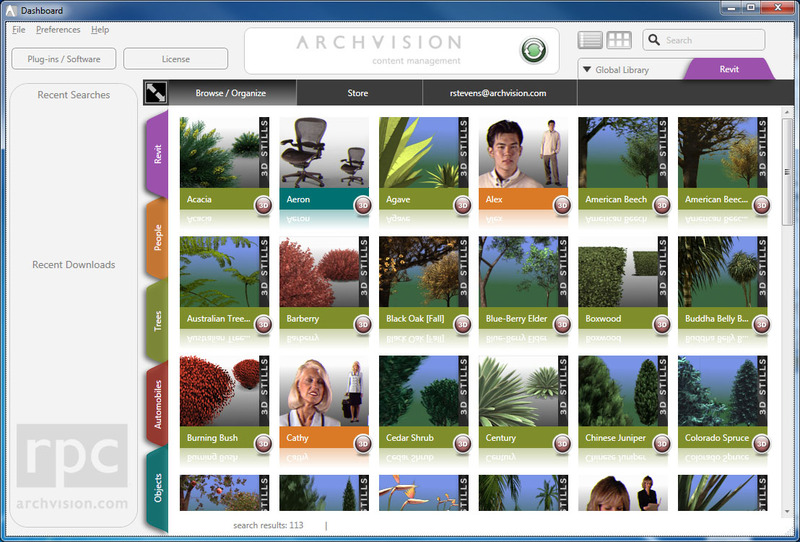 Over the years ArchVision’s RPC products moved beyond a relatively simple 3D Studio plug-in and a handful of content libraries to plug-in or native RPC support for over a dozen design/rendering platforms, several thousand RPCs produced by ArchVision and tens of thousands of custom RPCs created by our users. In hindsight I can break the past 15 years into two major epochs. The first was one of easing RPC integration with our partner’s software products and continued growth and supply of RPC content. By 2005 ArchVision had produced and released over 100 content collections and supporting over a dozen rendering applications including most industry standard Autodesk, Bentley and Adobe products. A customer purchasing all of our products would find a sticker shock of nearly $30,000 at checkout! Beginning in 2005 we began making major investments in our back-end infrastructure; setting the stage to move to a subscription-based licensing model. January 2007 brought the start of RPCs second epoch, RPC All Access. RPC All Access took what was previously $30,000 of software and made it all available for $499 per year! A huge value proposition for our customers and a dramatic change in how we thought about our products and business model. The launch and iterative release of our Dashboard product over the past couple of years is ushering in our latest epoch in delivering relevant design visualization and content management solutions. Our goal is to remain current with changes in our customers evolving production environments and continue to provide value. We have found ourselves serving not only full-time visualization artists using products like 3ds Max but also many architects creating visuals directly inside products like Revit. We see this as a challenge to move beyond “Rendering” to that of helping create “Presentations”. We’re excited about ArchVision Dashboard as it is setting the stage for a bevy of new features and services to help in this transition. Following is a rundown of the latest RPC features enabled by Dashboard and a sneak peek at features we have in the pipeline. Support for RPC with Revit goes all the way back to Revit 3, prior to Autodesk’s acquisition of the platform. 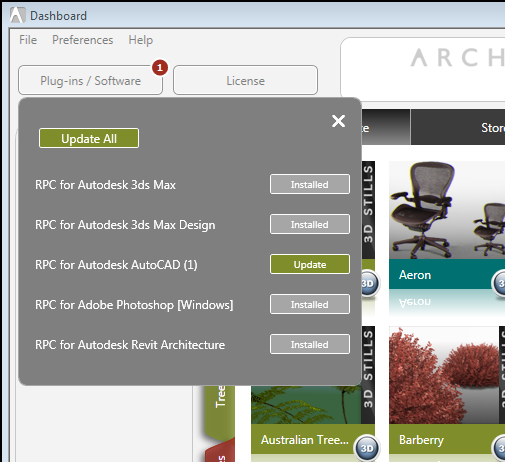 Most recently, Autodesk chose RPC as the native tree/plant solution for Revit. 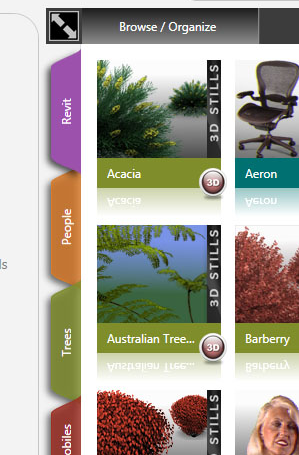 Revit users will find a good selection of tree and plants shipping with the product. Getting additional RPCs outside of what shipped with the product was another matter. As I’m sure many of you are painfully aware, getting an RPC from All Access into Revit was over 20 steps! We found that unacceptable and went to work on making that a one-step process from Dashboard. Now users can drag & drop any RPC from Dashboard directly into their Revit (2013 and above) model. You can also Drag & Drop directly into 3ds Max and Autocad from Dashboard. One of the primary goals of Dashboard is to provide improved ways to organize and search your content. Channels are one of our first organizing tools. We think of Channels as the first order of organization designed for visual browsing. Clicking on a Channel within Dashboard filters specific content that has been tagged to that channel. Dashboard supports what is called a “many-to-many” relationship between content and Channels. For example, you may find the same Oak Tree RPC in the Trees Channel as well as the Revit Channel. Channels represent different ways of organizing all of your content into logical groupings. A future update of Dashboard will allow you to create your own Channels and organize content in new ways. Search is one of the easiest ways to find content. In order for search to be effective the content being searched must carry the appropriate “tags” or “metadata” relevant to that piece of content. With Dashboard we’ve made all content search-able by their tags. A great feature of Dashboard is the ability to monitor the applications you have installed that support RPC and help you keep RPC Plug-ins and related software installed and up-to-date. We call the service that enables this feature “Beacon”. Beacon keeps track of the current versions of software that are available and alerts you within Dashboard of any updates that are available. One click within Dashboard is all it takes to keep plug-ins up-to-date. Over the past year we’ve been working to move from a machine-based licensing model to a user-based licensing-in-the-cloud model. There are several reasons for this move. First, it fits better with the way our customers use our products. They aren’t always working from one machine, sometimes moving between offices and from work to home. With Dashboard you can log in from anywhere automatically retrieving your license. This move to cloud-based licensing is also necessary for us to play well with the next generation of our partner’s products and services such as Autodesk RaaS. We’re listening! Many customers have dozens or even hundreds of users within their organization and admittedly, we haven’t made it very easy to deploy our solutions across an enterprise. We’re working to change that. Watch for a new “headless” Dashboard release for servers and easily deployable MSIs before year’s end. We’re also building a new Admin panel inside of Dashboard where you’ll be able to see and manage licenses and content across your organization. After that we plan to tackle centralized path management. See, I said we’re listening! Autodesk launched it’s first labs experiment called Neon for rendering Revit models as a cloud service in 2010. After native support for RPC was introduced in Revit and the RaaS service became official last year, our respective teams went to work on making sure all RPC Content will render in the service. We’re about there! Watch for full RPC-RaaS support beyond the native content that ships with Revit soon. We’ve had RPC Creator tools available for most of the 15 year history of RPC and you’ve created thousands of your own custom RPCs! Soon you’ll be able to drop any 32-bit PNG, TIF or TGA image onto Dashboard and convert it to RPC! This will allow you to take all of your commercial entourage libraries like those from Imagecels or Dosch Design or your own custom collection and convert them to RPC. As RPC they become infinitely easier to use in any RPC-enabled application such as Revit or 3ds Max. Dashboard will even automatically generate the preview images and icons for the RPC. All you have to do is give the RPC a name and specify it’s real-world height. No more building geometry, creating materials, adding textures, making objects ‘look-at’ cameras, blah, blah blah. Just drag & drop and RPC takes care of the rest! Entourage silhouetting within Revit… that’s all we’ll say for now!